To end the narrative of this cycle, you are faced with deciding the civil war between three clans in Dunland. This will secure safe passage to Isengard and will form a lasting alliance between the clans and Saruman. What could possibly go wrong? Play if: You somehow enjoy the Time keyword, you want a Ringmaker quest that is fairly average in terms of difficulty, you feel like a boss battle is the way to end the cycle, you want one last taste of the Dunland enemies before you leave for the Lost Realm deluxe box, you want an actual useful objective ally for once. What is different about this quest? : Time counters on locations that do not refill like they usually do, Dunland enemies, Chief Turch objective ally, a final boss with immunity while his camp is in play. Solo or multiplayer? : I have enjoyed this quest in solo, but it scales quite well for multiple players. The quest stages scale accordingly, and having more players means that some can focus on the locations. The problem with more players is that more locations are revealed with Time counters, meaning that location lock can be lethal in a multiplayer game. Another thing to note is that a lot of enemies will be revealed in 4 player games, making the scenario next to impossible to complete. Try to stick to 1 or 2 players for this one. Can I run side-quests for this scenario? : Yes, you can, but keep in mind that the stages have a refilling Time keyword on them. This means that you will either have to stomach their effect or bring enough willpower to burst through a side quest on turn 1. The final stage of this quest is actually the most ideal stage to explore some side quests, though at that point it is likely irrelevant. For options on what side quests to pick, I would go with Explore Secret Ways and Keep Watch. Do not bring Prepare for Battle, that extra card can be dreadful. What to look out for? : Drawing cards fuels the enemies, hand size must be kept at a minimum, time counters on locations force you to explore them, boss enemy at the end of the quest that can only be damaged if his location is explored, condition attachments, Chief Turch must stay alive. To start off this Dunlending civil war, the first player gains control of the Chief Turch objective ally. Then, the unique Raven Chief enemy and the unique Raven Chief’s Camp location are put aside, out of play. These will come into play during the final stage of the scenario. 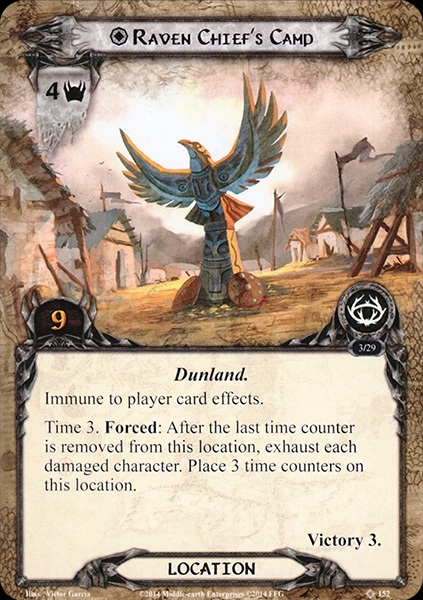 Players will have to search the encounter deck for a copy of the Dunland Battlefield and make it the active location. Since this location is revealed, players will have to add the time counters to this location. Then, 1 copy of Raven War-camp is added to the staging area, also with its 3 time counters on it. The players will now have to create a separate Raven deck and set it aside from the regular encounter deck. This Raven deck consists of all the enemies from the Dunland Warriors and Dunland Raiders encounter sets, but not the enemies from this specific scenario. The rest of the cards from the encounter sets will be shuffled into the normal encounter deck along with all of the Antlered Crown encounter set. With both decks separated, the players will now have to choose 1 different enemy out of the Raven deck and add it to the staging area. This does not trigger any When revealed effects or surge. For a solo game, pick the Dunland Prowler, as it removes surge from the Raven deck and is a relatively easy enemy to take. The Dunland Tribesman and the Dunland Berserker are good options for any other players as well. If you are going up against this quest with 4 players, your options are starting to run out, and you may have to pick an enemy like the Bandit. This early in the game, you will have a lot of cards in your hand, so try to play as many cards during the first round in order to soften up the enemies a little. With all of these cards now in place, the staging area will look quite full but don’t be daunted by this, it is now time for the first planning phase. The B side of this quest card has very little to tell you besides having a regular time counter of 3 and an effect if all 3 tokens are removed. The players will have to remove 1 time counter off of each location in play at that point. This can potentially lead to some nasty triggers going off from the locations themselves. Because of this, players are advised to explore as many locations as they can, especially if you are about to run out of time on your quest stage. In contrast to the locations, the quest card does get its time counters replenished so you will have another 3 turns before the same effect goes off again. Exploring this stage doesn’t usually take so long, maybe you will even clear it before the initial 3 time counters have been removed. If you can keep a clear board state and have good location control, this is the point where you want to stall for a little and explore side quests. The quest only takes 10 progress to clear, which isn’t a daunting task even in true solo. These 10 quest points are however accompanied by a 5 quest point active location from the start of the game: Dunland Battlefield. During your first turn, you will want to clear this location, just to get it out of the way. Depending on what you have drawn during staging, you will want to travel to a location every turn and then clear it. Since the setup also places a Raven War-camp in the staging area, you will have a good target for your first travel phase. In order to clear active locations quicker before they run out of time counters at the end of the turn, I will advise that somebody runs Tactics Legolas with Arod and some Blades of Gondolin. Sure, you won’t get their +1 attack since Dunlendings aren’t Orcs, but their extra point of progress can be used to clear active locations faster. Strength of Will and Mirkwood Explorer are also great tools to get that active location explored before the round is completed. This also opens the way to getting more progress on the quest stage next turn. If you are unable to clear the active location in time, try to use Distant Stars as a panic button to discard the active location and replace it with another location. This resets the time on the active location, giving you more time to explore it. Once the tenth progress token has been placed on the main quest, the players immediately advance to the next stage. I would advise keeping a clear board state since the transition brings out more enemies. At the moment the players progress through to this stage, they will have to reshuffle the Raven Deck discard pile (which is different than the regular discard pile!) into the Raven deck. Then, every player will have to add the top card of that Raven deck to the staging area. This will bring out 1 enemy per player, but without any keywords or When Revealed effects triggering. The players have no choice other than accept these enemies as they are. Hopefully, the players have been killing enemies at this point and are ready for some more enemies at this point. If not, consider using some threat reduction to avoid the enemies for a while. With 25 threat being the lowest threat of all the enemies, you should be able to find yourself underneath that value if you build for it. This stage also has a Time 3 keyword but is different from the previous stage. If players ever run out of time counters on this stage, they will each have to grab the top card of the Raven deck and put it in the staging area, exactly like the A side of this quest card instructs you to do. There is little that players can do against this in multiplayer, but in true solo, you could prepare some Traps in the staging area for the incoming enemy. The stage also informs players that all locations in the staging area now have +2 quest points. The quest card doesn’t make the locations immune, but it will take a lot more tricks to clear locations in the staging area. Note that this does not count for the active location, that still needs the printed quest points worth of progress tokens to clear. In order to clear as many locations as possible, I will advise players to continuously chip away at some locations. If you should clear them while they are in the staging area, great! If not, maybe you can try to put as much progress on it as possible. If you then travel to that location, maybe you automatically clear it. This also works with the Woodmen’s Path attachment. This will automatically clear the active location when you travel to it. You can then use Thror’s Map as an action to travel to a second location, clearing quite a lot of threat in the staging area, and potentially clearing 3 locations in one turn. The quest has no other active triggers to remember, just the boost to the locations. The stage will require 15 progress to clear, which can be achieved within a couple of turns. Note that this is the last time that players can bulk up for the final boss fight with the Chief, so get your board state setup and ready before progressing. Since the Chief will be engaging the first player, you could stall a little and wait for the optimal player to be first. Be careful that this might cause you to get more enemies out of the Raven deck though, so be ready to handle them as well. You will want as few enemies in play at the moment you progress since the switch between stages will require you to fetch more enemies. Try also to have your active location spot cleared for travelling to Raven Chief’s Camp once it comes out. That is a really fitting name for the final stage of this cycle, though it is not the last stage of the game entirely (The game is alive dammit). To start this final stage off with, you will have to add Raven Chief and the Raven Chief’s Camp to the staging area. Then, every player other than the first player reveals a card from the top of the Raven deck. The Chief and the Camp both add 4 threat to the staging area, but you will likely remove them during the same round they enter play. I will advise the players to immediately travel to Raven Chief’s Camp in order to get its threat out of the staging area. This will also allow you to hopefully avoid the Forced effect on the location before time runs out. There is no Travel effect for this location, so travelling is an easy choice. This will also allow you to take down the Chief within a few turns. The stage has again got the Time keyword on it, which will run out after just 2 turns. When it runs out, each enemy engaged with a player will make an attack. This can cause you to have your defenders exhausted before combat begins, making it extremely hard to survive the round. At that point, you should consider running attack cancellation events like Thicket of Spears or Feint to relief some players from having to defend that phase. This, in turn, allows them to muster some attack and kill engaged enemies. Once the players have completed the turn in which they killed the Raven Chief, they have won the game and can move on to Isengard. This concludes their journey through Dunland. The adventures will now shift to the realm of Arnor and Angmar, battling Undead enemies and terrible weather. Shadow effects are not too common, with both modes having a 60% chance of getting a shadow effect. Average threat on the cards you reveal is around 1.5 between both modes. Every treachery besides Fierce Folk has the possibility to surge. This makes it easy for you to reveal more than 1 card per player each round. 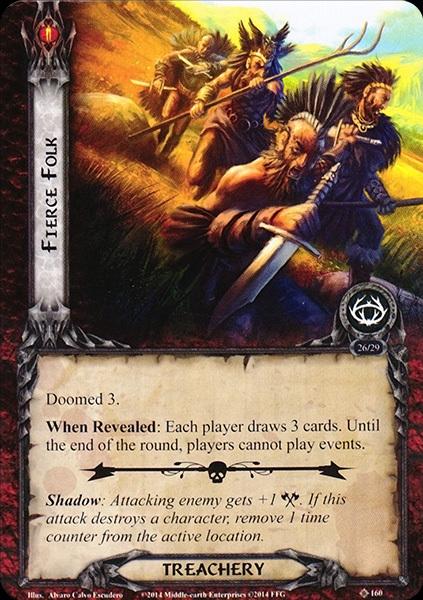 Doomed 3 is on Fierce Folk, this is quite a big jump in threat, but is not very common, being on just 2 cards in the game. Raven Country will boost your threat even more though, so be careful with bringing Doomed of your own. Time counters are being removed by multiple effects on treacheries and enemies. The number of tokens removed varies depending on the number of cards in your hand and locations in the staging area. Raven Chief cannot have attachments and will be unable to be damaged while Raven Chief’s Camp is in play. The statistics of the encounter deck do not count the cards that are placed into the Raven deck. This separate deck consists out of 100% enemy cards (14 in Normal and 10 in Easy mode) and has its own discard pile. Like the encounter deck, this deck will only get reshuffled during the quest phase. The cards that are used during setup are also not counted, making the encounter deck seem small at first glance. 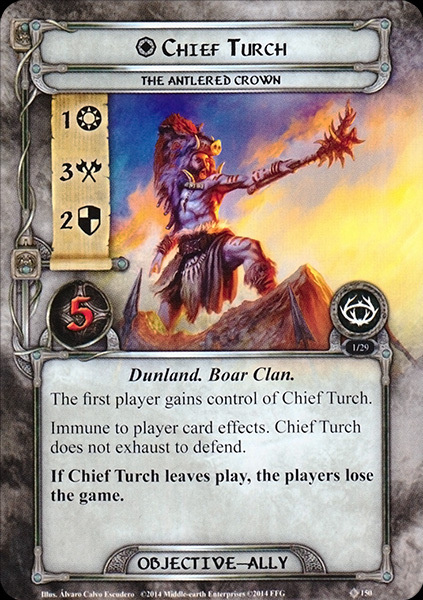 Chief Turch is actually a useful objective ally in this cycle. Mugash and Nalir were useless or even counterproductive, but Turch is actually pretty good. Not only are his stats worthy of a hero (they are the exact same as either version of Boromir), but he also doesn’t exhaust to defend. This ability he shares with Beorn, as well as him being immune to player card effects. This prevents you from directly healing Turch, but damage cancellation doesn’t target Turch himself. Honour Guards will be enough to prevent him from taking damage. Having this ally not exhaust to defend leaves him open to use his impressive 3 attack strength during combat as well. Chief Turch usually absorbs 1 or 2 attacks before he needs healing, but he makes for a great emergency button in the early game. 5 hitpoints means that he can take a little punishment before he is killed. Try to avoid getting Turch killed by the way, as that will cause you to lose the game. The locations in this encounter deck have Time counters on them and have effects that trigger once those time counters have run out. Be aware that the time counters do not get replenished after the last one has been removed. Only Raising the Cry can replenish these counters. Remembering this rule makes the game a lot easier. Raven Chief’s Camp: This is the only unique location in the encounter deck and will be added to the staging area when the players advance to stage 3. Its 4 threat make it a perfect target to travel to during the next travel phase, just to get that threat out of the staging area. The Camp does not have a travel cost, so you are free to travel there as you please. 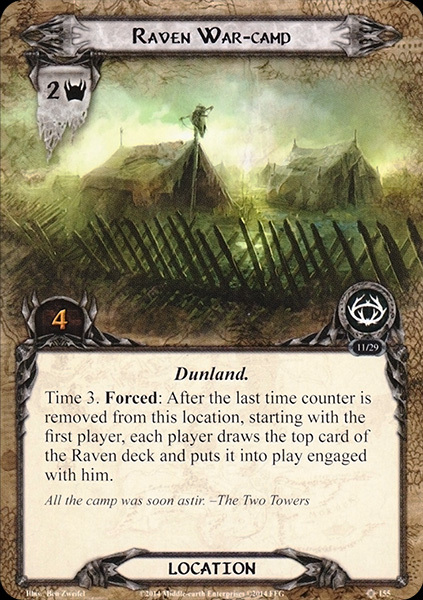 This is the only location in the scenario that replenishes its time counters when they run out, so it is vital that players explore the Camp as quickly as possible. They will have to do this without relying on location control since this location is immune to player card effects. Try to put your progress tokens on other locations in the staging area while this location is active. Having 9 quest points doesn’t help much, but if the players throw a lot of willpower at the next quest, they can potentially clear it in 1 or 2 turns, just in time before the Time keyword triggers. The Forced effect on this location is probably the nastiest of them all, bar maybe the Raven War-Camp with four players. The players will have to exhaust each damaged character when the last time counter is removed from this quest. This leaves your damaged characters unavailable to do anything else for the round. Try to run healing to keep damage at a minimum, and have big allies absorb the most damage if you do get to distribute it, rather than spreading it out among multiple characters. If you are afraid that Raising the Cry will remove the last time counter from the location, consider questing with your damage characters in order to make the most out of them. 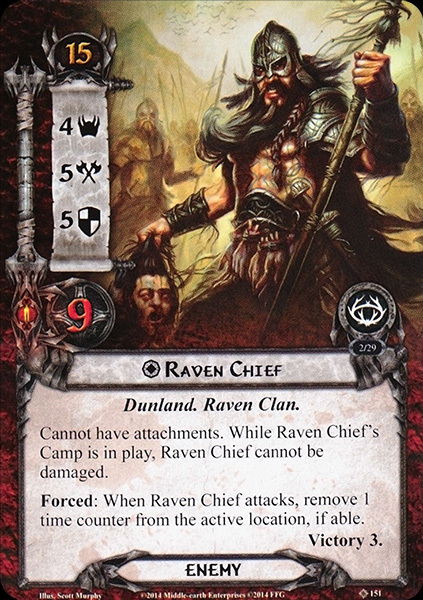 Clearing the Raven Chief’s Camp will allow players to damage the Raven Chief, so it is important to clear this camp as soon as you can, hopefully in one turn. 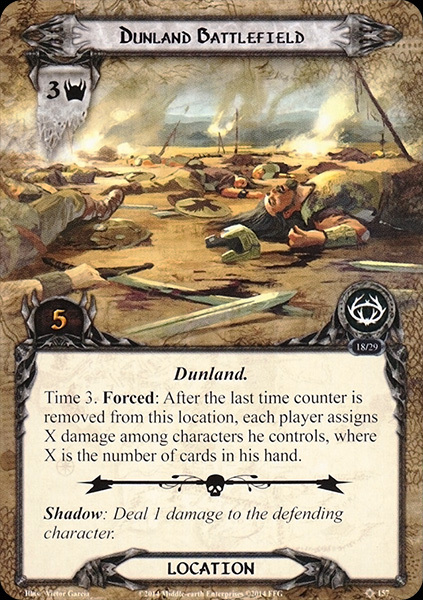 Dunland Battlefield: The Battlefield starts off as the active location during the first round and provides a buffer of 5 quest points before progress can be placed on the active quest. With a reasonable 3 time counters on it, you are sure to explore this first copy well in time before you have to do its forced effect. This effect will cause every player to deal 1 damage among characters he controls for each card in hand. In the early game, this can sting a little, as you will have a reasonable sized hand, and not a lot of characters on the board yet who can take this much direct damage. Having some healing options will definitely be a good addition to your deck to counter this damaging effect. With 3 threat, this location is a good option to travel to should you get the chance. 3 Time counters won’t last forever and will run out sooner than you think. If players can keep their hand size to a minimum and players can cancel cards like Fierce Folk, consider travelling to locations that grab enemies first. You can take some damage from this effect, no problem. Though this also depends on the type of deck you are running. Ents are far better off tanking the damage from this location than Hobbits or Silvans. Raven Country: In terms of highest stats on a location, Raven Country beats every other location in this encounter deck. With 6 quest points, it will be hard to overcome the location while it is in the staging area. Luckily, the Time keyword on this location allows players to breathe for a while. 4 time counters will be enough to allow players to clear other locations first, before attempting to clear the Raven Country. Remember that card effects like Asfaloth and The Evening Star can also clear this location while it is in the staging area. You can chip away at this location and hopefully clear it before time runs out. If it does however, the players must raise their own threat by the number of cards in their hand. If they have a chance to ditch cards to Protector of Lorien or if there are any events the players can play, I would suggest doing so to minimise the increase in threat. As long as players can maintain their hand to a small size, this location is pretty harmless and low on the priority list. Raven Village: A kind of filler location, the Raven Village isn’t as bad as many other locations in this encounter deck. The Time 2 keyword is the lowest value, meaning that it will likely run out before players can explore it using conventional methods. However, needing just 3 progress to clear this location can be easily done in that time. If the players do end up running out of time on this location, they have to add the top card of the Raven deck to the staging area. This isn’t as bad as the War-Camp, but can still drag out some nasty enemies at unwelcome times. The Village is actually a pretty good draw in a solo player game, as players will likely be able to travel here and clear it during the next turn, provided they cleared the active location and have no other locations that are higher on the priority list. Raven War-Camp: This is probably one of the worst locations to have multiple copies of in a multiplayer game. If the 3 time counters are removed from this location, each player adds the top card of the Raven deck to the staging area. In a 4 player game, this results in a total of 4 enemies. Do this during staging, and you have just increased the threat in the staging area by a lot. And that is even without considering having to trigger multiple copies of this location at once. This location is a leg up from the Raven Village that added just 1 enemy, so this should be higher on your priority list unless you are playing with just 1 player. Luckily, the location only requires 4 progress to clear and contributes just 2 threat in the staging area. Clearing it will be easy, but players should make this top priority to avoid having to engage more enemies. The game starts off with one of these War-Camps in the staging area, so there is immediately a target for your location control. There are a lot of enemies in this scenario, though most end up in the Raven deck. The Chief is removed until the end of the game, so there are really only 2 new enemies that you will have to watch out for during staging. Raven Chief: This is the final boss of this cycle, and his stats show you that he is not messing about. The Raven Chief gets added to the staging area when the players advance to stage 3, and he will likely attack during the same round as well. His low engagement cost of 15 will force players to engage him unless players use effects like Noiseless Movement or Advance Warning to keep the Chief in the staging area. This will cause you to quest over his 4 threat but will save you a round of combat with him. Once you do engage this enemy, keep in mind that he is immune to attachments, but no to other player card effects. You can still Feint him, which prevents his Forced ability that removes a time counter from the active location. It is crucial that you prevent as many attacks as you can from this guy, else the active location (which is likely Raven Chief’s Camp) will trigger again and again. The 5 attack on the Chief is enough to deal some damage to allies, but if you have a proper defending hero, he shouldn’t be too much to handle. Chump blocking is also an option, since you may lose your defending hero to an untimely shadow effect. The shadow effect on the Raven Skirmisher can boost the Chiefs attack to a staggering 9 if you have Raven Country as the active location. In order to damage this enemy, players will first have to clear the Raven Chief’s Camp. This allows players to then pile on the Raven Chief and kill him with some combined attacks. Remember that he is still not immune to player card effects, so direct damage decks will work fine against him. His 5 defence makes him a serious wall that is hard to overcome by players so I will advise that at least someone is running defence reduction in the form of Marksman of Lorien, Tactics Aragorn or Rivendell Blade. This makes killing the Chief a lot easier. Direct damage also still works and can penetrate his 5 defence without any issues. Running a few copies of Goblin-cleaver will already do a lot of damage, and Ranged characters with Bow of Yew can do the rest. Once the Chief has been destroyed, he gets added to the victory display. The players then have to survive until the end of the round in order to win the game. Raven Warrior: The bigger one of the two new non-unique enemies, the Raven Warrior boasts some impressive defensive stats and an engagement cost of 36. This engagement cost is important, as you will want to prevent this enemy from coming down until you are ready for him. He has a particularly nasty engagement effect that will force players to remove 1 time counter from locations in play for each card in the engaged player’s hand. In the early game, this can be brutal, as players will have a lot of cards left in their hand if they do not have a way to discard them yet. There will also be only a few locations in play, so you are likely to remove all of the time counters on one location and trigger its Forced effect. The 4 base attack value on this enemy is also something to watch out for, as he can become a lot to handle with a shadow card attached to him. Chumping is advised or you can discard his shadow and defend with an ally like Defender of Rammas. Attacking back will take some time, as he has a healthy hit point pool of 5. Some direct damage can cut him down to size, making him much easier to manage. This is actually a perfect enemy to have stuck in a Trap like Ranger Spikes, as he will not be engaging, rendering him next to useless for the encounter deck. Attaching a Secret Vigil will then nullify his threat, allowing you to forget all about him. Raven Skirmisher: While not as terrifying as the Raven Warrior, this enemy is much more likely to engage players since its engagement cost is only 26. Luckily the Raven Skirmisher hasn’t got an effect when he engages you, but rather an effect when he is revealed. The players will have to decide to either remove a time counter from the active location or reveal an additional encounter card. The decision has to be based on a number of variables. If there is no active location or no time counter left on the location, the players will have to suffer the additional card. If the players have an active location with 1 time counter left on it, I would also say that they take the additional card, as they would otherwise have to resolve the forced effect on the location. Only if the players are sure to reveal no other encounter cards and if they have enough willpower to clear the active location, should they remove a time counter from the active location. If the location has 2-3 time counters left, it is a pretty safe bet. After the Raven Skirmisher has been revealed, he really becomes an annoying enemy that will require very little to kill. His 2 defence and 2 hitpoints can cause him to die to a variety of allies or to heroes like Beorn and Quickbeam. He doesn’t attack for a lot and shouldn’t cause you too many problems, besides distracting your defenders from any other threat coming out of the encounter/Raven deck. The treacheries in this scenario will try to fill your hand and remove time counters from locations where possible. All of them are worth cancelling, since losing time counters on your locations will make the game a lot harder. Raising the Cry: If there is any treachery you are looking to cancel, it is this one. Raising the Cry will remove 1 time counter off of every location in play (including the active location). This can cause some locations to lose all of their time counters so the players will have to do the forced abilities on them. This can add a lot more threat in the form of enemies or raise the threat of some players who couldn’t get their hand size down fast enough. On top of it all, this treachery will add new time counters to every location in play that has no time counters left, either because of this effect or if they ran out earlier. This basically resets all location that ran out at some point. To make matters worse, if there is no location in the staging area (there can be an active one) this card gains surge. This is a treachery you actually want to see in your first round of staging, as your locations will have a lot of Time left on them. However, in the later stages, this treachery will result in a swift defeat as it will screw with your plans and your timing. Cancelling this treachery will be of the utmost importance since it will buy you an additional round of location control in order to clear any location in play. Getting multiple copies of this treachery in the same round is bad luck and can swiftly cause players to lose as they will have to remove 2 time counters from all locations and resetting those that ran out. Best case scenario for this one is to either have no locations in play or to have just 1 sitting in the staging area with 3-4 time counters left on it. But with multiple copies of this treachery in the deck, it is a great motivator to clear those locations asap. Note that this treachery only removes time counters from locations, so those on the quest stages should be safe. Fierce Folk: This treachery is rather unique, as it will force you to draw 3 cards when it is revealed. Drawing these cards will not only increase your hand size but might also trigger effects on the Dunland Tribesman or the Berserker. On top of this, players will be unable to play events until the end of the round. This will not only screw any player that was hoping to use events during combat, but it will also make sure that players will be unable to reduce their hand size (unless they play an ally with Hirgon, but that is a corner case scenario). This treachery can provide players with more cards to play during the next planning phase, but it will make the combat phase a lot more “interesting”. Getting this treachery early will be even worse, as your hand will be quite big at that stage already. Always play events that help with questing (such as Elrond’s Counsel) before staging, in order to avoid having to hold on to it. Cancel this treachery if you can and if it is going to hurt you in the combat phase. If players have killed the majority of the enemies and are in a good position, they can endure this treachery. They will still have to take the Doomed 3 though, which might put their threat above that of some enemies. Not all is lost though if you do draw into 3 new cards. The card pool has plenty of tools you can use that will discard cards from your hand. Healing with Imladris Caregiver will be an excellent option, but discarding to Protector of Lorien and/or Elven Spear can cause an increase in stats on attached characters. Just like in the previous scenario, location control is key. It will be important to get progress on the locations in the staging area before they run out of time counters. You will also be kind of forced to travel each turn in order to clear the locations in time. The Dunland enemies are back and will scale in difficulty along with your hand size. This forces players to play a lot of cards during the planning phase, so keep your deck cheap and try to avoid drawing cards if you can. Fierce Folk will keep your hand filled to a reasonable limit, so there is little need for card draw, as this powers up the enemies. There are a lot of Condition attachments in this quest, so try to run condition removal cards like Bulwark of the West or Power of Orthanc. You can also try to rush through the stage in order to get rid of the attachment. In solo, you can certainly try to get a lot of traps out. This will catch enemies coming out of the Raven deck if stage 2 ever runs out of time tokens. You will be better prepared for enemies this way. Entangling Nets and Ranger Spikes are the obvious choices, as they reduce the stats on enemies, making it easier to avoid or kill them. It is important to make sure that time counters do not get removed on multiple locations at once, especially on Raven War-camps. This will bring out a lot of enemies all at once, which will require some really dedicated decks in order to fend them off. With so many enemies engaging players in the later stages of the game, having a way to cancel attacks will be a blessing. Thicket of Spears will be blocking a lot of attacks and allows a player to keep characters back to attack or block other attacks with Sentinel. Since the Condition attachments attach to the current quest, you can also choose to go up against side-quests in order to get rid of them that way. This will require some luck though, and you will have to be sure that you can finish the side-quest as well. When deciding to travel, try to avoid locations that only have 1 time counter remaining. You will likely have no choice than to let their Forced effect trigger. Try to go to locations with 2 or 3 time counters left, since those can be explored without triggering their effects. If you have ways to dispose of the active location during the combat phase, then do travel to a Time 1 location. Cards like Legolas and Blade of Gondolin are of great value here. Don’t underestimate the power of the Eryn Galen Settler in this quest. The ability to discard another location with the same title as the one you just explored is a great way to prevent the time counter on the second location to run out. It will also remove some threat from the staging area, which makes it easier to clear the active location next turn as well. Try to run attachments and allies that will allow you to discard cards from your hand so that they won’t clog up your hand. Protector of Lorien is amazing against this quest, and the Noldor archetype has some excellent allies that you can use to get rid of unnecessary cards in your hand. Also consider good old Spirit Eowyn for this quest, as she allows all players to discard cards in exchange for progress on the stage. These effects can also get rid of any unwanted cards you drew because of Fierce Folk. You can leave cards in the binder that negate Travel costs, as there are none on the locations in this encounter deck. This allows you to play other characters instead, that might do better at placing progress on locations in the staging area. When placing progress on locations in the staging area, it is important that you focus on one location to clear and then move on to the next, not to have some progress on all of them, but not enough to clear them. Driven Back will be a hard counter against this strategy. Prioritise characters like Rhovanion Outrider and Mirkwood Explorer over Northern Trackers for this. So ends the final Adventure Pack from the Ringmaker cycle. This still leaves 2 scenarios to be analysed before we can progress to the Angmar Awakened cycle. Hopefully, this can be done before the end of the month! Next time, The Three Trials.